The Kedarkantha trek takes you into of the Govind National Park. For five days spent in the national park, you'll have ample time to explore the rare, alpine wildlife, vegetation and wildflowers of the national park. The trek through the centuries-old forest of pine and oak makes for absolutely stunning views, especially when the forests are painted with shades of white in the winter snow. From visiting the shores of high-altitude lakes to camping in the open meadows or snowfields, this trek takes you to some of the most photogenic locations, hidden away in the mountains of Uttarakhand. • Spend the night at picturesque campsites in the Himalayan wilderness. • Trek through sprawling and dense forests of pine and oak. • Climb the Kedarkantha peak to get mesmerizing view of the Himalayas. Consumption of alcohol and drugs is strictly prohibited during the trip. Consumption of cigarettes and other tobacco products is not recommended. Travellers are required to follow instructions of the trek leader during the Kedarkantha trek. For cancellations made 30 days or more before departure of the Kedarkantha trek: 100% refund. For cancellations made 15-29 days before departure of the Kedarkantha trek: 50% refund. For cancellations made less than 15 days before departure of the Kedarkantha trek: no refund. All travellers are required to be sign an indemnity form before beginning the Kedarkantha trek. The tour operator takes utmost care to ensure safety of the travellers and shall not be held responsible for any mishap, accident or loss of life during the Kedarkantha trek. The tour operator reserves the right to cancel or alter the itinerary of the Kedarkantha trek depending upon the weather conditions and other factors. If extra costs are incurred due to changes in the itinerary, they will be borne by the traveller. Report at the Dehradun railway station. Here, you'll board a private vehicle and head out into the mountains of Uttarakhand. The 6-hr drive to the a camping ground near the Mori River will take you past scenic villages like Damta, Purola and many more. In the final stretch of 22 kms before your destination, you'll enter the Govind Pashu National Park. You'll arrive at your campsite for the evening, set besides the Mori River, by late afternoon. Overnight in tents at the Mori River campsite. Rural roads travelling across mountain slopes on the way to Mori. Begin the day with a short drive to the village of Sankri. From here, you'll continue the rest of the journey on foot. The trek will take you through the Saud village on a gradual ascent. You'll reach the base camp for the Kedarkantha peak by later afternoon. The base camp is surrounded by beautiful tall trees, forested mountain slopes, and a small lake. Overnight in tents at the Kedarkantha base camp. Terraced farms and grasslands near the mountain village of Sankri. Today is summit day! Begin trekking on an increasingly uphill route from base camp. You'll reach the peak after a challenging 2-hr trek. Here, you can spend some time admiring the excellent views from the top of the summit. An hour later, you'll turn back and retrace your steps back to base camp. 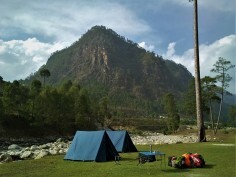 Overnight in tents at the Kedarkantha base camp. Glorious views of the Himalayas from the top of Kedarkantha. Continue the trek over a downhill route, back to the village of Sankri. Compared to the previous day, this section of the trail will be relatively easy. As you reach Sankri, you'll board a private vehicle and travel back to the camping ground near Mori River. Overnight in tents at the Mori River campsite. Trek past mountain top villages and interact with local farmers and shepherds. Leave early in the morning and bid farewell to the mountains of Uttarakhand. You will continue the drive from Mori and reach Dehradun by early evening. Your trip ends here. Tents pitched at the Mori River campsite. Overnight stay at a guest house. Sleep in clean and comfortable rooms with basic facilities on sharing basis. Participants sleep in sturdy tents in the Himalayan wilderness on triple sharing basis. Participants reach Dehradun latest by 22:00 hrs. The trip ends here. The Nanda Devi Express, departing from Delhi at night, is one of the recommended options to get to Dehradun. The operator will arrange your transport in a private vehicle to Sankri.